First place - Firebusters (John Wynn, Irving Barfield and Brent Dupree) pictured with Rodney Harrington. Several groups, businesses and organizations gave it their all to entertain the masses and, most importantly, have a great time at the inaugural Brew Sync competition Tuesday, Jan. 29 at the Cane River Brewing Co. The event served as a fundraiser for the Natchitoches Jazz/R&B Festival, which has been set for May 10-11. Guests who came out voted for their favorite team by monetary donation for the People’s Choice Award. First, second and third place were decided by three judges: Ed Huey, Brandi Chasteen and Lauren Ford. Coming out in first place was the Natchitoches Fire Department, second was BOM and third was Ivan Smith Furniture. Taking home the People’s Choice Award was the team at Maglieaux’s. 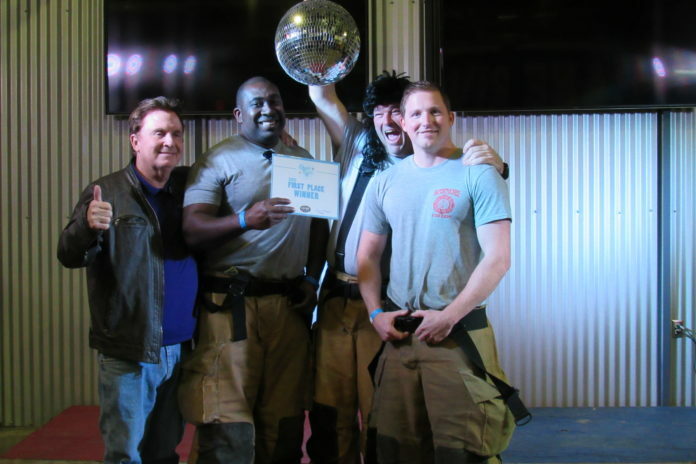 First place – Firebusters (John Wynn, Irving Barfield and Brent Dupree) pictured with Rodney Harrington. Other performance were by Natchitoches Fire District #6, Northwest Louisiana Cancer Center, Natchitoches Police Department and the Queens of the Krewe of Dionysos. Rodney Harrington, with the Jazz/R&B Festival, said he was pleased with the event and asked the crowd if it should continue next year, which was answered with cheers.